A deep dive into this small-cap gaming headset maker. 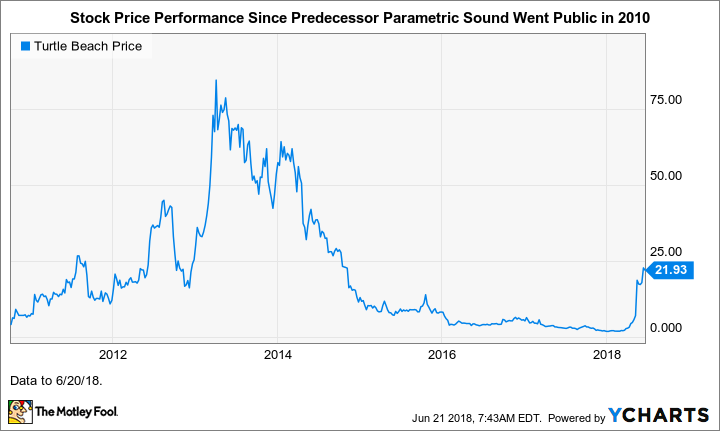 I'd like to introduce readers to a company The Motley Fool has yet to cover in a full article: Turtle Beach (NASDAQ:HEAR), which is a leading maker of video gaming headsets. It's the only pure-play, or close to pure-play, publicly traded company in this space, and sports a market cap of $300 million. Let's take a deep dive into Turtle Beach. In its current incarnation, Turtle Beach has been in business since 2005 -- that's when it entered the gaming headset space -- and has been publicly traded since 2014. Its roots, however, date back to 1975 when Turtle Beach and Voyetra Technologies were founded. In 1996, Voyetra bought Turtle Beach and the company became Voyetra Turtle Beach (VTB). In January 2014, VTB was acquired by publicly traded Parametric Sound Corp., which had gone public in 2010 and brought to the current company its HyperSound technology. In April of that year, the company was renamed Turtle Beach and began trading under the "HEAR" ticker. Turtle Beach stock price. Data source: YCharts. The company's share price was so low recently that it risked being delisted from the Nasdaq. In order to regain compliance, Turtle Beach did a 1-for-4 reverse stock split, effective after the market close on April 6. The stock has come roaring back to life thanks largely to the company's encouraging recent financial results, which are being driven by the soaring popularity of battle royale-type video games, most notably Fortnite Battle Royale and PlayerUnknown's Battlegrounds (PUBG), both of which were developed by private companies. In 2017, it held a 42.1% share, by revenue, of the North American console gaming headset market -- more than the share of its three largest competitors combined. In Q1 2018, it held a 45.9% revenue share of this market, up 7.1% year over year. So far in 2018, the company has "seen unprecedented industry growth ... in the headset market, with Turtle Beach outpacing that industry growth by nearly 38%," said Stark at a recent industry conference. Turtle Beach also has a business called HyperSound, which is a directed audio technology. In October, it inked a new licensing agreement with the French company Waves System, which uses the tech in commercial applications, such as retail point of sales and museum exhibits. The company hasn't provided financial results for this business, which would lead one to believe its revenue is likely negligible. Turtle Beach has a number of patents on its headsets and HyperSound tech. While these are surely helpful, the company's primary competitive advantage in its core headset business is probably its strong brand name. In May, Turtle Beach released robust first-quarter financial results and substantially increased its full-year 2018 guidance, resulting in the stock soaring 216% for the month and tacking on about 26% so far in June through Wednesday. In the quarter, revenue surged 185% year over year to $40.9 million and gross margin more than doubled to 36.8%, from 15.4%. Net income was $2.0 million, or $0.16 per share, compared to a net loss of $9.9 million, or $0.81 per share, in the year-ago period. A secondary reason for the stock's big rise is likely that management has been strengthening the company's balance sheet. In March, it renegotiated its loans, extending their maturities and reducing their interest rates. It expects savings of at least $3.5 million over the next five years from this move. In April, the company retired its Series B preferred shares "in a set of transactions that produced over $10 million of value for our stockholders," said Stark on the Q1 earnings call. More specifically, the company retired this $19.3 million liability, which was growing at 8% per year, "at a discount of more than 50% relative to its redemption value," CFO John Hanson noted. Turtle Beach's growth potential is highly dependent upon the staying power of the battle royale gaming trend, in my opinion. While most trends do die down after the initial hoopla, there seems a solid chance that this trend will have staying power. We can expect more new games of this type to be released, and for better or worse, these games can reportedly be quite addictive. Moreover, while this trend is the company's primary growth driver, the gaming market is expanding due to a variety of factors, including the rising popularity of esports. 1. International -- The lion's share of its sales are in North America and the U.K., which means there are big untapped markets -- most notably China, which is the world's largest gaming market and "virtually untapped" by the company, Stark said on the Q1 call. 2. PC gaming -- The company has a stranglehold on the console headset market in North America, but this isn't true in general of the PC gaming arena, which is particularly popular in certain geographic regions. Management views this global market as roughly the same size as the global console gaming market. Turtle Beach stock isn't for risk-adverse investors. For those comfortable with some risk, however, it deserves a place on your watch list. It's benefiting from a trend that might have staying power and is reasonably valued at just 15.7 times forward earnings. The main thing to watch is the strength and longevity of the battle royale gaming trend. Also, keep an eye on the company's balance sheet for further improvements, and the competitive landscape, which is bound to heat up.